Bristol’s bubble tea specialists CUPP are launching the UK’s very first tea café of its kind in Quakers Friars on Thursday 21st March. After a successful 2012 serving bubble tea from their mobile tea van (called Pearl) at festivals and around Bristol, CUPP are very excited to announce the arrival of the ‘CUPP Box’. 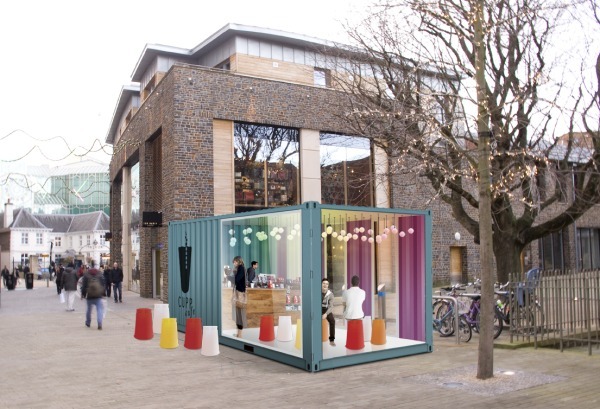 The more permanent unit is a shipping container which has been lovingly converted into a funky tea café, and which will continue to serve their signature bubble teas which always use fresh fruit and milk. To celebrate the launch, there will be a half price offer between 12 – 3pm on the opening day on Thursday. Inspired by their street food roots, CUPP wanted to create an innovative outdoor/indoor space whilst maintaining the ethos of street food. The shipping container has been modified in such a way that come sunny days, the sides open out for the café to spill out onto the street but can be cosy and relaxing on those colder days. The CUPP Box will be open 6 days a week from Monday-Saturday, and will be offering a range of quality coffee, Taiwanese noodles, and tea inspired cupcakes to accompany their bubble tea and iced fruit tea. As well as new exciting items on the menu, customers will now be able to enjoy all of this whilst sitting and relaxing in the ‘box’. CUPP is planning to launch more ‘CUPP Boxes’ in other cities in the UK in 2013 and will be launching a delivery service in Bristol soon. Details will be released on their website, Facebook and Twitter.